To commemorate Halloween, I wanted to revisit two monuments that I have written about earlier. The monument above, sculpted by Lorado Taft, one of the premier sculptors of his day, was created to honor Dexter Graves, an early Chicago pioneer. 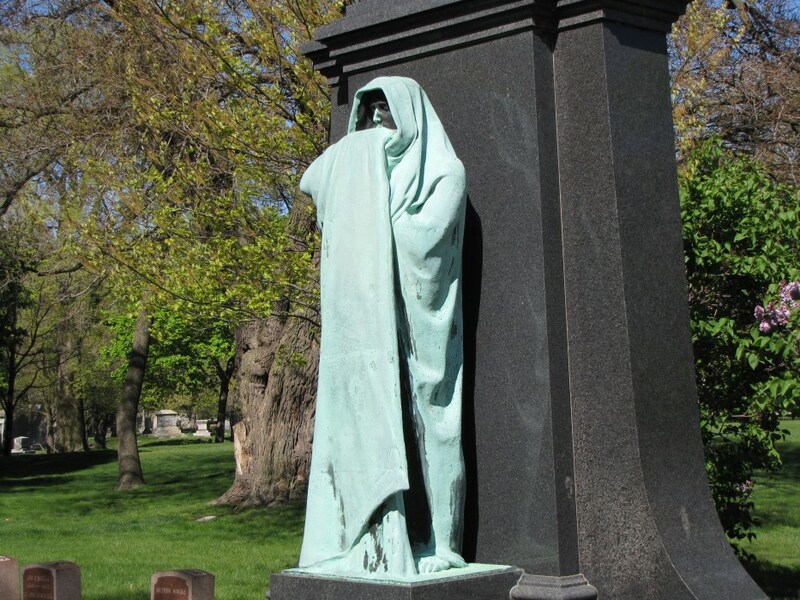 The bronze figure that Taft created is named Eternal Silence, an obvious metaphor for death. 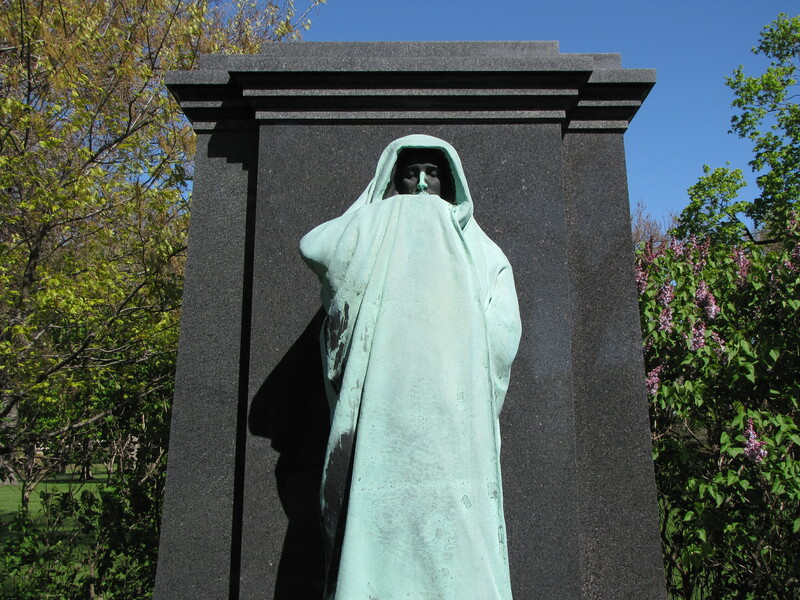 The foreboding cloaked figure stands against solid black granite–black being the traditional color representing mourning and death. The figure has his eyes closed and gathers the shroud to his lips preventing him from speaking. The bronze has an eerie feel to it, in part, because of the way the patina has formed on the statue. The shroud has a greenish blue unnatural color. Except for a highlight on the nose, most of the face has remained dark and recedes from the hood, making it appear more menacing and mysterious. The second monument is tucked away in the Forest Lawn Cemetery at Omaha, Nebraska, dedicated to Josiah and Alma Wasserburger. 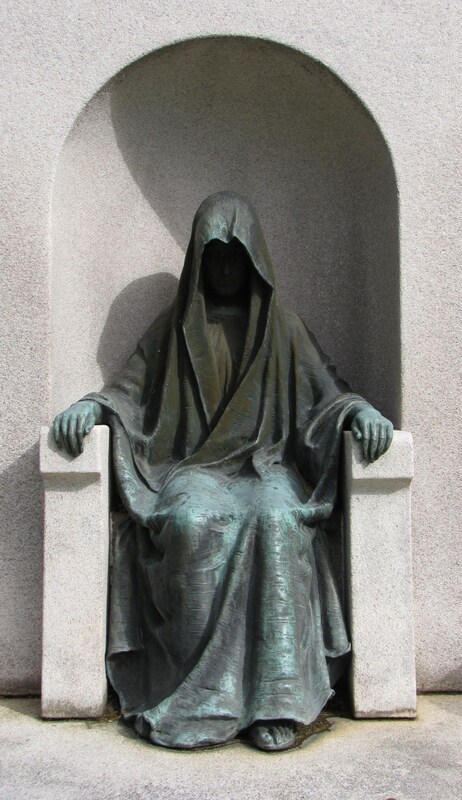 The monument features a seated and cloaked figure. The inscription divulges no clues about who the figure represents, but leaves behind a message about the body’s decay but not of the soul’s. Could you imagine visiting a cemetery on Halloween and seeing these two statues? Spooky! Vincent Price’s relatives were buried in Bellefontaine Cemetery in St. Louis and the grounds keeper told me that he used to show up in the middle of the night in his limousine to visit their graves!